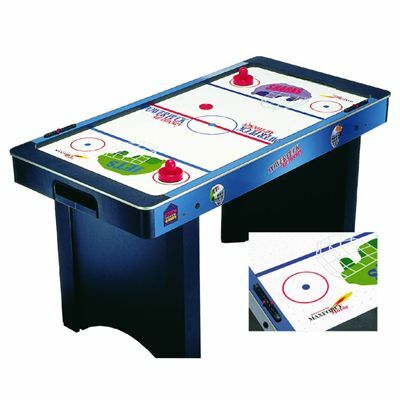 The BCE 4 foot Blue Grey Air Hockey Table - Amazing fun for an impressive price! A great value motorised air hockey table complete with all the accessories required to get going. So why not take on friends and family and be the best! Bring the speed, action and excitement of ice hockey into your home with this sturdy Air Hockey Table. Heavy duty motor blows air through hundreds of holes into the table surface creating a cushion of air for fast, non-stop action. Entertain your guests with an evening of action – just be warned – fast and furious game play may be hazardous to your china!! Not only is this table the perfect product for hours of fun, it is also very stylishly designed. for submitting product review about BCE 4ft Blue Grey Air Hockey Table.